Copyright Japan Atomic Energy Agency All Rights Reserved. The Japan Atomic Energy Agency (JAEA) announced on February 7, 2014, that it has developed a world-first technology to separate and recover lithium from seawater while generating electricity at the same time. Lithium is a vital material for lithium-ion batteries and fusion reactors. South America has the world's largest lithium reserves, estimated to be 30 million tons. This lithium, however, is typically recovered through the natural evaporation of brine in salt lakes, a process that the world's fast-growing demand may soon outpace. Seawater, on the other hand, contains approximately 230 billion tons--a virtually unlimited amount of lithium. JAEA's new technology for the lithium recovery from seawater is innovative separation principle that uses a lithium ion conductor (ceramic material with NASICON crystal structure) as a film through which only the lithium in seawater can pass. 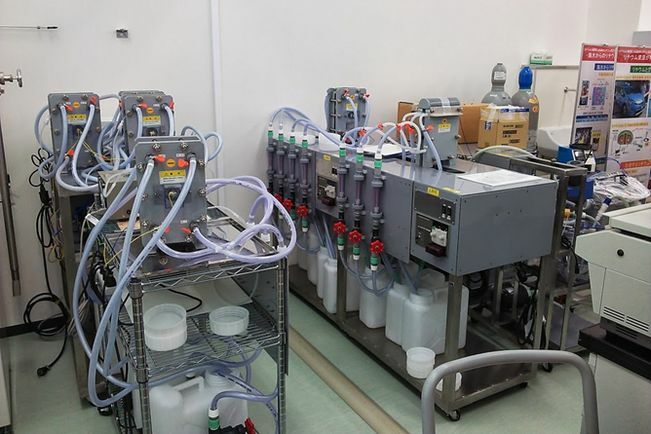 The verification experiment successfully recovered as much as 7% of lithium contained in seawater. The process also generates electricity, requiring no external power source. JAEA also successfully purified the solution to produce lithium carbonate powder, a raw material used to make lithium-ion batteries. It is hoped that this method will be useful in lithium recovering from used lithium-ion batteries, and concentrated seawater in seawater desalination plants.